Astigmatism might be the most misunderstood eye health problem; in fact it is just a vision defect of the eye. People can be born with astigmatism — actually, most people probably are born with some degree of astigmatism. Normally, the cornea and lens are smooth and curved equally in all directions, helping to focus light rays sharply onto the retina at the back of your eye. However, if your cornea or lens isn’t smooth and evenly curved, light rays aren’t refracted properly. 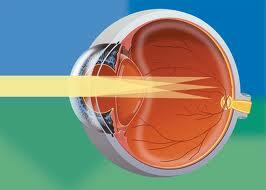 In an eye with astigmatism, light fails to come to a single focus on the retina to produce clear vision. Instead, multiple focus points occur, either in front of or behind the retina or both. Mixed astigmatism – one principal meridian is nearsighted, and the other is farsighted. Astigmatism also is classified as regular or irregular. In regular astigmatism, the principal meridians are 90 degrees apart; perpendicular to each other. In irregular astigmatism, the principal meridians are not perpendicular. Most astigmatism is regular corneal astigmatism, which gives the eye a football shape. Irregular astigmatism can result from an type of eye injury that has caused scarring on the cornea. Astigmatism typically can be corrected with eyeglasses, contact lenses or refractive surgery. How to read astigmatism prescription. The axis of astigmatism in eyeglass and contact lens prescriptions describes the location of the flatter principal meridian of the eye using the above 180-degree rotary scale. In addition to the spherical lens power used to correct nearsightedness or farsightedness, astigmatism requires an additional “cylinder” lens power to correct the difference between the powers of the two principal meridians of the eye. So an eyeglasses prescription for the correction of myopic astigmatism, for example, could look like this: -1.75 -.50 x 90. The first number (-1.75) is the sphere power (in diopters) for the correction of myopia in the flatter (less nearsighted) principal meridian of the eye. The third number (90) is called the axis of astigmatism. This is the location (in degrees) of the flatter principal meridian, on a 180-degree rotary scale (in which 90 degrees designates the vertical meridian of the eye, and 180 degrees designates the horizontal meridian).